Eddie is just a star, he is so gentle, has helped me go back to basics with cleaning, and gives me the science chat in the language I can understand. At Dublin D18 Dental Rooms our team of Dental Hygienists play one of the most important roles in maintaining your overall oral health. They not only help to keep you on top of your oral health issues but they can in the long term prevent infections, pain and swelling by keeping your gums and teeth healthy. They are also extremely beneficial to our patients who already have good oral health and simply want to keep things maintained and polished. Our team of dental hygienists also play a very important role in the treatment of advanced gum disease. They work in close contact on referral form our Dentists to provide first class standards of care and ensure that your treatment is explained and outlined clearly before commencing your journey. At your initial session our hygienist will customise a treatment plan suitable for your needs. 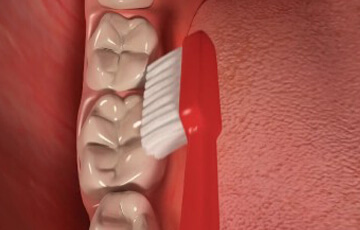 Treatment will initially commence with the removal of plaque and tartar form every surface of every tooth. For routine cleanings the teeth will also be fully polished. For more extensive treatments appointments will be spread out over 2 to 3 visits depending on your requirements presented on your treatment plaining. 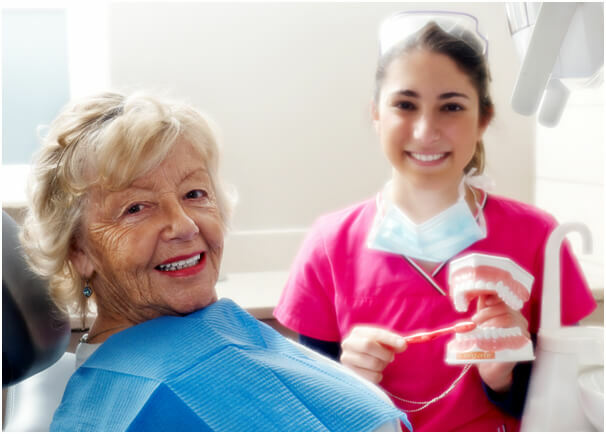 Our hygienists will also take you through your new home care regime step by step and they will run through any products necessary to maintain your healthy smile. They also offer diet advise and smoking cessation (if necessary) as part of your plan. Hygienist visits can also help to alleviate bad breath issues caused by plaque or tartar build up along with instructions on tongue cleaning which can also help with this issue. At Dublin 18 Dental Rooms for general maintenance sessions we recommend visits every 6 months with our team of dental hygienist. Our patients with more complex issues may be recommended visits every 3 to 4 months for maintenance. At Dublin 18 Dental rooms our team of dental hygienists deliver an exceptional service for children and students. Their warm and caring nature make it a very pleasant experience from the age of 4 to 16 years old. Children can find it particularly hard to remove plaque or tartar in hard to reach places which can build up over time. Our hygienists will carry out a full scale and polish of all of the teeth. They will encourage children and students to use specific home tooth brushing techniques and they may recommend oral hygiene products which will help them with their oral home care maintenance. Our hygienists can also offer preventative care for your child. They can offer fluoride treatments which is a safe and effective way to safeguard your child's growing teeth from developing decay. The fluoride is painted on to the surface of the teeth helping to remineralise them. Our hygienists also provide fissure sealants for children. This is a tooth coloured sealant which is applied to the biting surface of the teeth protecting them from decay. A very important role for our hygienist at your children's visit is to provide diet advice. Snacking in between meals can have detrimental effects on your child's teeth along with high sugar content drinks throughout the day. Our hygienist will discuss healthy alternatives for your child to prevent tooth decay. After your initial periodontal therapy session you will book an appointment to continue with active periodontal treatment. At this visit we will commence quadrant root plaining under local anaesthetic for deep cleaning below the gum level. Appointments will be scheduled for an hour long to carry out this treatment. Usually consisting of 2 to 4 appointments spread out over a month. Our hygienists will talk to you in further detail about your diet and re inforce home oral hygiene care. As you already are aware ther is no cure for periodontal disease, however after completion of a number of visits for active perio therapy we strongly recommend that you attend for 3 monthly intervals. This is crutial and palys an essential role in ensuring the supporting structures of your teeth (gums and bones) are maintained. Periodontal disease will go through active and quiet periods and it is when the disease is active that the bone and gum structures can be destroyed. The gaol for our team of hygienist at Dublin 18 Dental Rooms is to reduce this active stage and stabilise the condition. This can only take affect once the patient is diligent with their oral home care regime and continuing with 3 monthly hygienist visits. Stabilizing the disease in smokers however is far more difficult to achieve. Due to the detrimental affects that smoking has on the teeth and gums and your overall health, we will offered each and every patient smoking cessation advise. However there are certain cases that can need further referral to a periodontist if non responsive to treatment. There are two main factors influencing re infection – inefficient plaque removal after treatment has been carried out or your immune systems response. In some non-responsive cases antibiotic gels will be applied to the periodontal pockets. At Dublin Dental 18 Rooms we are committed to keeping up to date with the latest research in periodontal treatments and oral hygiene products which will benefit our patients. We have a full selection of oral hygiene products at our practice for your home care maintenance. Periodontal disease is sometimes called gum disease; it is a serious chronic infection that attacks both the gums and bone that hold your teeth in place and can in some cases lead to tooth loss. It has both active and quiet phases and is one of the most prevalent diseases around which at some point almost every adult will suffer from it in some way or form. Periodontal disease is mainly caused by bacterial plaque which is the white sticky film that constantly forms on all surfaces of your teeth. These bacteria attach themselves to both the surface of the tooth and at the gum line, once attached they then multiply and release toxins; the toxins then cause an inflammatory response which can lead to periodontal breakdown causing the bone and the gums supporting the teeth to be destroyed. The hygienist has suggested treatment for periodontal disease, what can happen if I decide not to have this treatment? If periodontal disease ids left untreated there is inevitably going to be more bone loss leading to mobility (teeth becoming loose), drifting of teeth and eventually tooth loss. Recent studies also suggest that periodontal disease not only affects dental health, it can also affect your overall health and well being. There are proven links between heart disease, diabetes, osteoporosis and increased risk of low weight babies. Our team of hygienists will firstly check all your medical history. They will carry out a full periodontal assessment taking pocket debts of each tooth. At this stage they will carry out a gross scaling to remove larger deposits of plaque or tartar on the surface to help with the initial removal of bacteria from the mouth. They will then tailor a treatment plan for your needs and set up a series of appointments to be carried out under local anaesthetic to allow access further down under the gums. This is known as quadrant root plaining and this treatment is carried out anywhere from 2 to 4 visits. They will discuss home maintenance and they will advise exactly what oral hygiene products are essential to help you with your new home oral hygiene regime. Our team will print off a treatment plan outlining the full costings and visits required.